This entry was posted in Blog, Latest Updates on April 22, 2015 by Matt Miller. 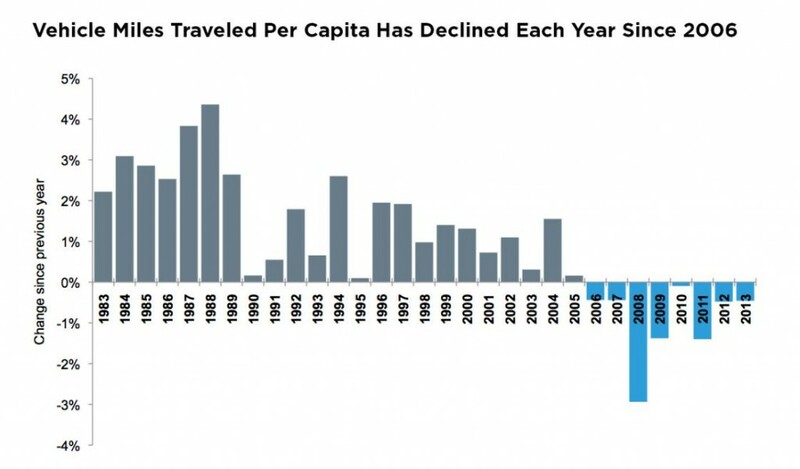 It is clear that our next long-range transportation plan will need to anticipate the possibility that future VMT per Capita could indeed remain flat or even slightly decline over time as the tastes and preferences of future generations change. This effect could combine with technology changes, such as various levels of vehicle automation, to allow current infrastructure to successfully accommodate future travel demand to a greater extent than is currently anticipated. It may be difficult to quantitatively apply these trends to funding decisions in our next long-range transportation plan; however, project and policy decisions should at least consider the trends on a qualitative level. Do you think that Millennials will continue to drive less than previous generations as they age and have children? Do you think that technological advances, Intelligent Transportation Systems and some level of driver assist or vehicle automation, will allow current roads to accommodate much of the travel demand in 2040? Do you think that we will need new terrain roads and highways in the future to the extent that we have in the past? This entry was posted in Transportation and tagged Transportation, Demographics, Long-range transportation plan, technology, age wave, Millennials on April 15, 2015 by admin.